We are delighted to welcome the Cork Foundation to TAPSTAK! 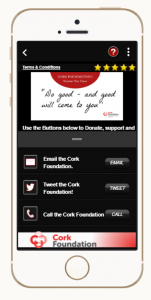 Contact, support or donate to the Cork Foundation at the tap of a button with the new Cork Foundation micro-app! The Cork Foundation is a unique social enterprise fund, fuelled by donations from Cork people at home and abroad who want to support social entrepreneurs and businesses that need funding to bring about positive social change in their local towns and villages. The aim of the Cork Foundation is to unlock the potential of social enterprise in local communities across Cork city and county to help community and voluntary groups by providing funding to create jobs, which will have a direct positive impact on the wider community. Donate to the Cork Foundation by SMS. Contact the Cork Foundation by email. Tweet and show your support to the Cork Foundation. Call the Cork Foundation team.